Everybody knows that even in a small telescope you can see on Jupiter two brown belts. However when you turn your telescope on the planet now, you will see only one stripe! The South Equatorial Belt (SEB), twice as wide as Earth and more than twenty times as long, is not actually gone, but may be just hiding underneath some higher white clouds. The last time this happened was in 1993. When Jupiter is visible from my garden, the Sun is already high up in the sky. It took me 15 minutes to find the planet. Searching an object (except the Sun, the Moon and Venus) with a Dobson in broad daylight isn’t an easy job! Once in the eyepiece I could even see Jupiter easily in the finderscope (9×50). Jupiter in daylight seems like a ghost. You have the impression to look through the planet. 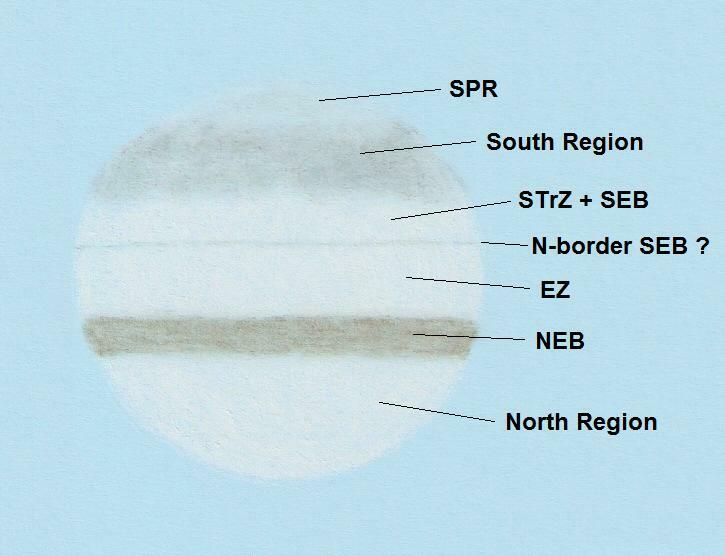 The North Equatorial Belt (NEB) was easy to see. But I was never so happy I couldn’t find something (this doesn’t happen fast in astronomy!). The SEB was nowhere. I guess the thin line is the northern border of the SEB. Some details are not like actual photos of Jupiter. I saw the South Polar Region (SPR) brighter than the region just north of it. The north side of Jupiter looked as white as the Equatorial Zone (EZ), but in reality it is much darker. Excellent sketch and write up about the appearance of Jupiter. Interesting story about searching Jupiter and others planets in the evening.